Get ready for a doozy today. Thirty five images. Fourteen hundred words. But it’s cheap form to spit posts twice in a row, and let’s get all our tears out in one go. A ton of people know who Spider-Man is. 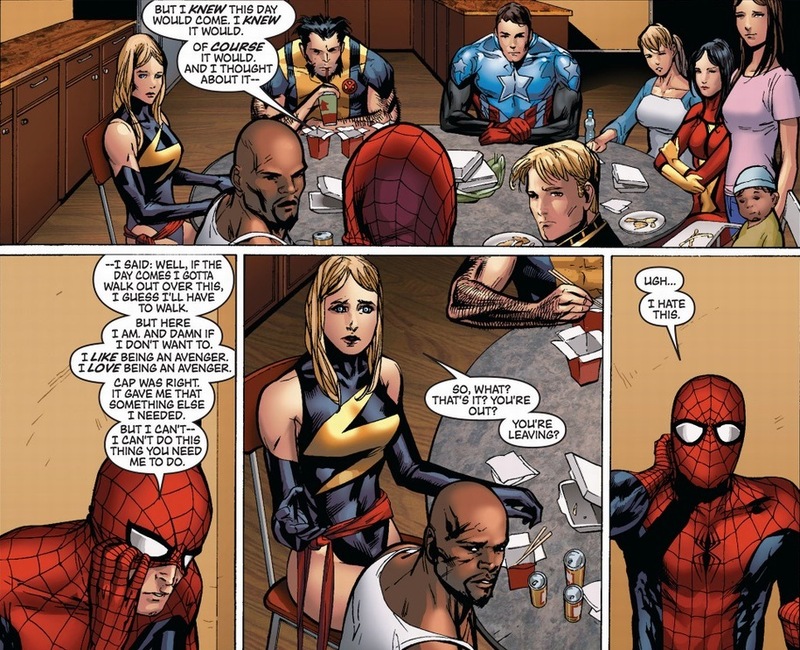 Not like you or me, but other fictional characters in the Marvel universe. And probably Batman too, if you count the company crossovers. Look, we take a suspension of disbelief among superhero secret identities. For instance, Superman’s glasses despite him working for the best investigative journalists in the world. 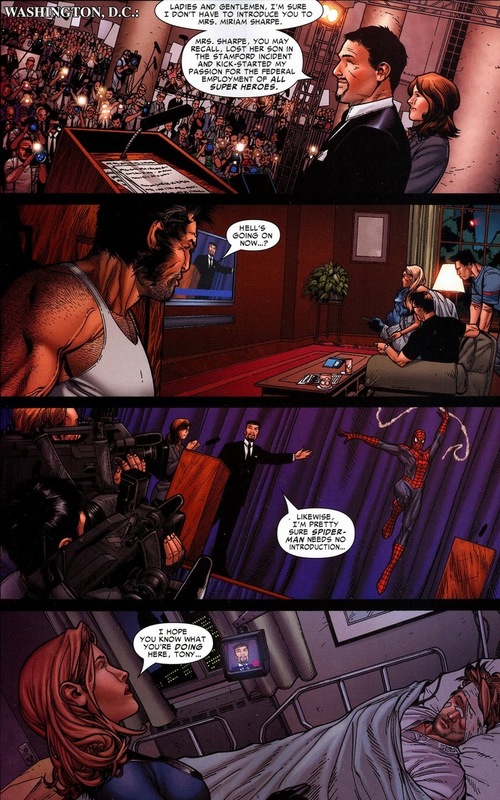 But when Peter does reveal his face to loved ones, allies, enemies, and occasionally on live TV, the consequences (while cathartic) lead to unexpected results. 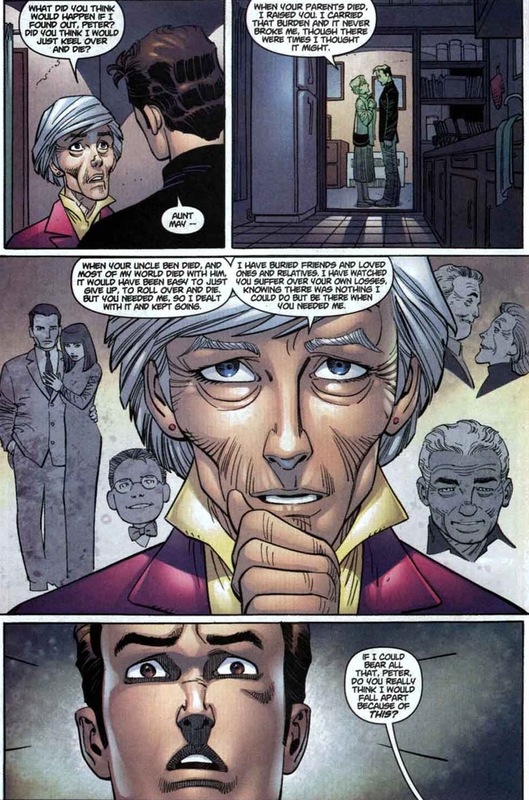 Sometimes a stronger bond, a teenage kiss, or a long series of events that leads to Aunt May getting shot, Mephisto broke up Peter and Mary Jane’s marriage, and an incredible humiliation Kingpin has never experienced before in his entire published history. 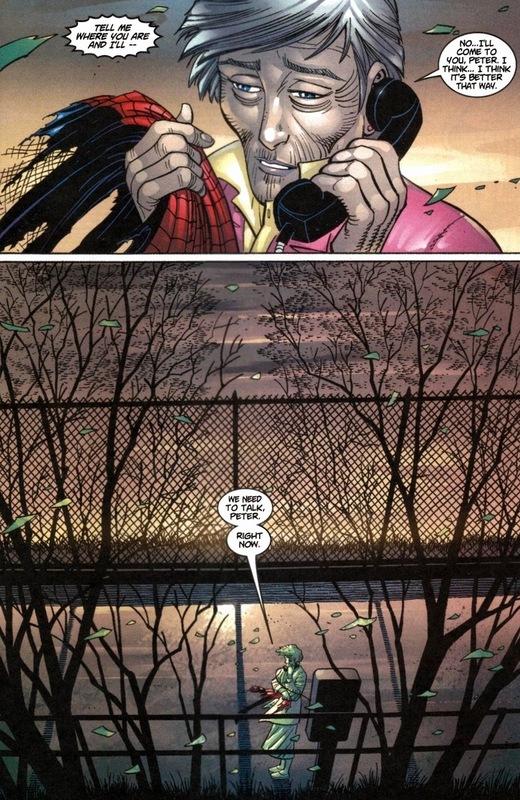 Today, we’re going to read some of those emotional secret identity reveals. It’ll be fun. Hard to argue that ended up being a smart decision on Spider-Man’s part. And unfortunately, it took place during Iron Man’s jerk phase of the mid-2000s. Supervillains tend to use stuff superheroes care about, like loved ones and friends, to attack their enemy who they can’t win against in a fistfight. 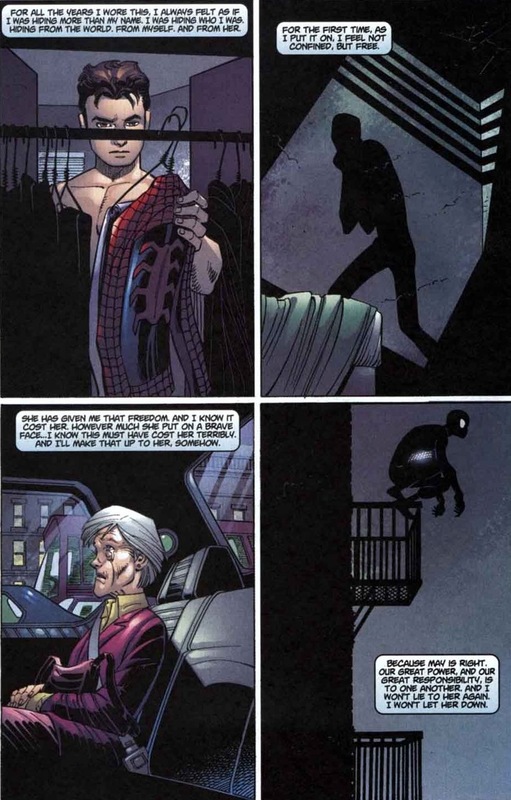 For that obvious reason, Spider-Man’s identity remains a closely guarded secret. Y’know, until he sits people down and explains that he dodges Goblin Gliders for a living. After the controversial Spider-Man arc One More Day — where his marriage broke up and Spider-Man’s secret identity went back in the box it sprang from — we once again get to witness Spider-Man exposing himself to colleagues. I mean, the face only. 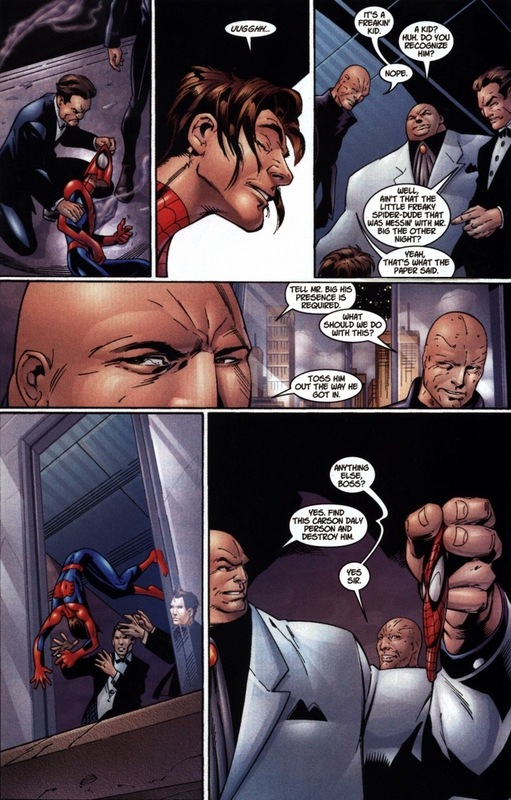 Y’see, Doctor Strange put a magical/psychic mindblock on Spider-Man’s identity, essentially hiding anyone from figuring out Spider-Man’s Peter Parker unless Peter personally reveals himself. Which he does. A lot. 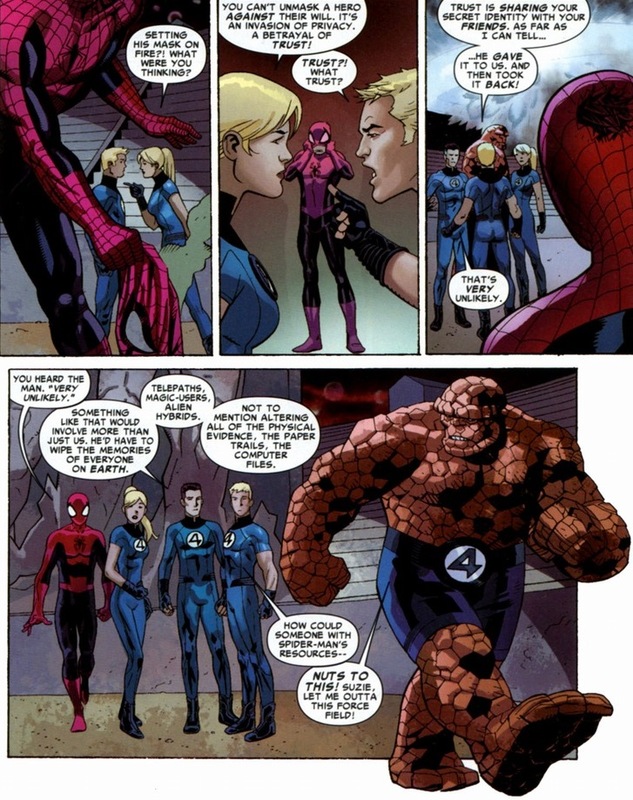 In Amazing Spider-Man #591, written by Dan Slott and drawn by Barry Kitson, Jesse Delpergang, & Dale Eaglesham, the Fantastic Four re-discover the secret. After some bickering, of course. 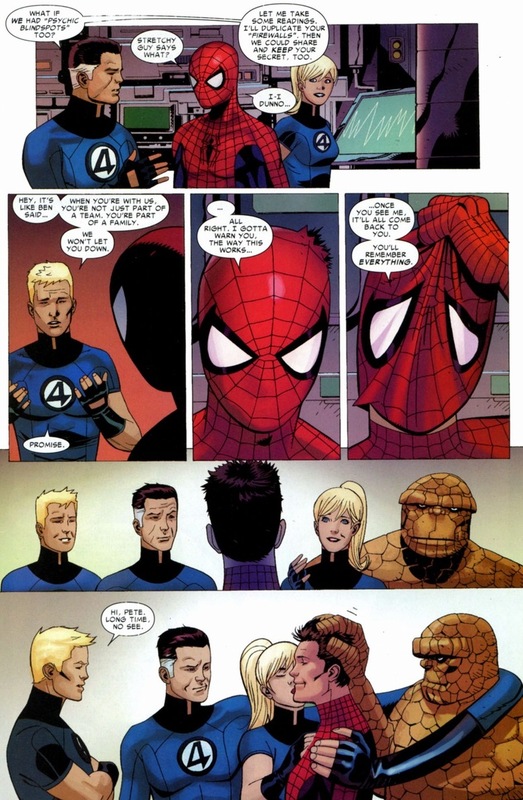 But even when friendship won’t convince Spider-Man to lose the mask, Mr. 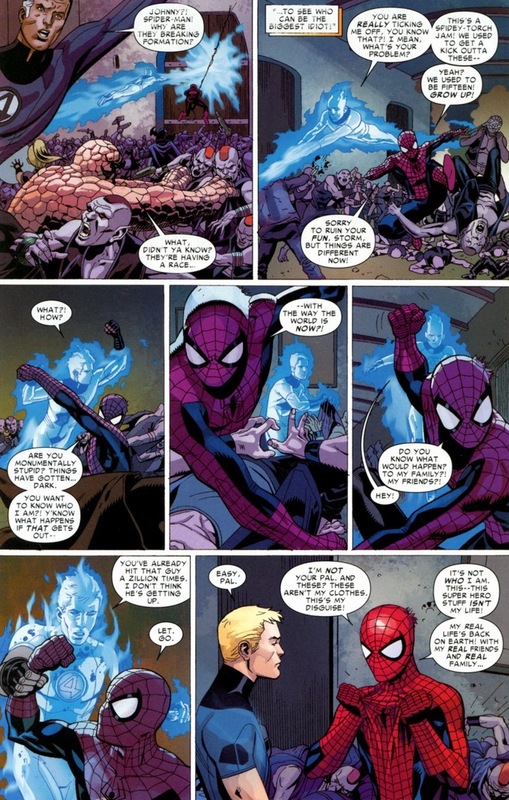 Fantastic knows to appeal to Spider-Man’s one true weakness: geeky science stuff. 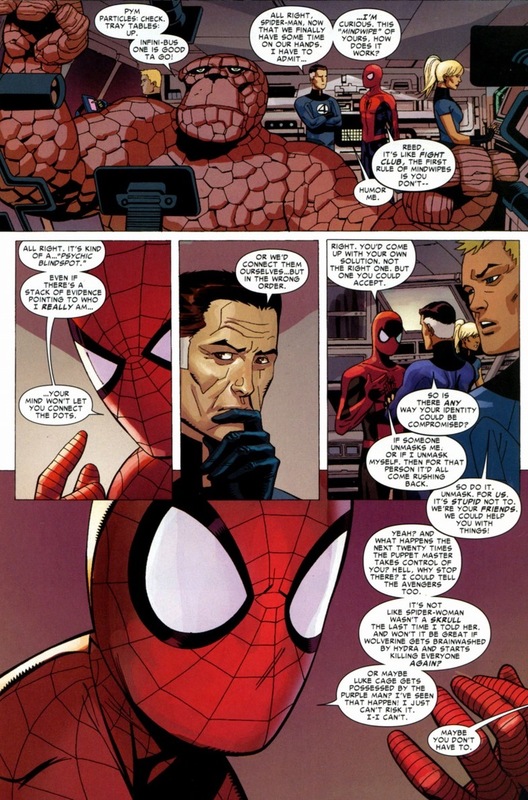 As wonderfully close friends as the Human Torch and Spider-Man are (both banter, went through puberty in spandex, and date supermodels), Peter really has more in common with Mr. Fantastic. One group of close friends and teammates down, one to go. 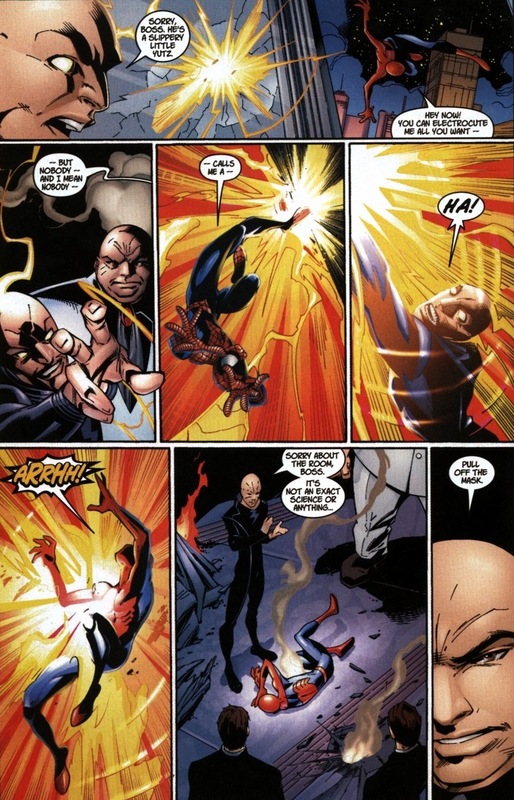 Because during New Avengers #51, written by Brian Michael Bendis and drawn by six super talented artists, the group just defeated shape-shifting, superhero-impersonating Skrulls. 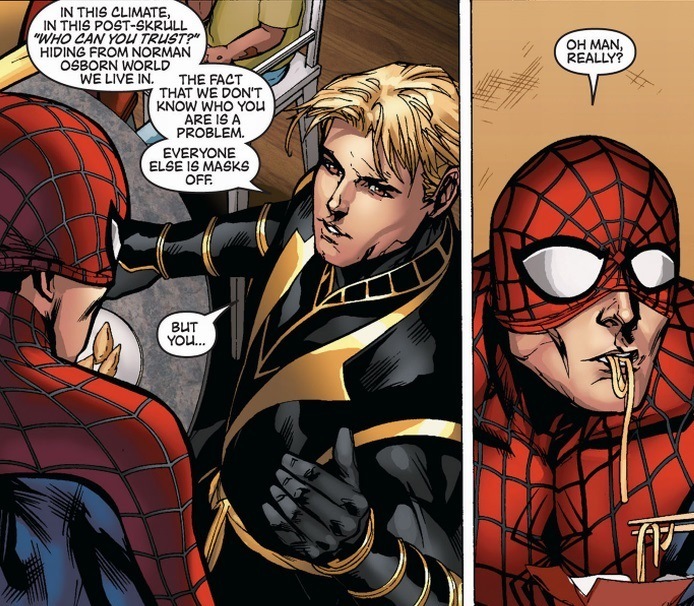 And Hawkeye (now Ronin) figures if Spider-Man wants to continue to not pay rent and eat Chinese food in the Avengers Mansion, he should probably pony up that secret identity thing. That and the whole Skrull stuff. You recognize that New Avengers roster? I figure you know most of them, but Mockingbird’s in the blue and white gymnast clothes, Jessica Jones wears the pink t-shirt, and in the corner we have Jessica and Luke Cage’s baby. She’s not part of the team. Oh yeah, and Jessica went to high school with Peter. 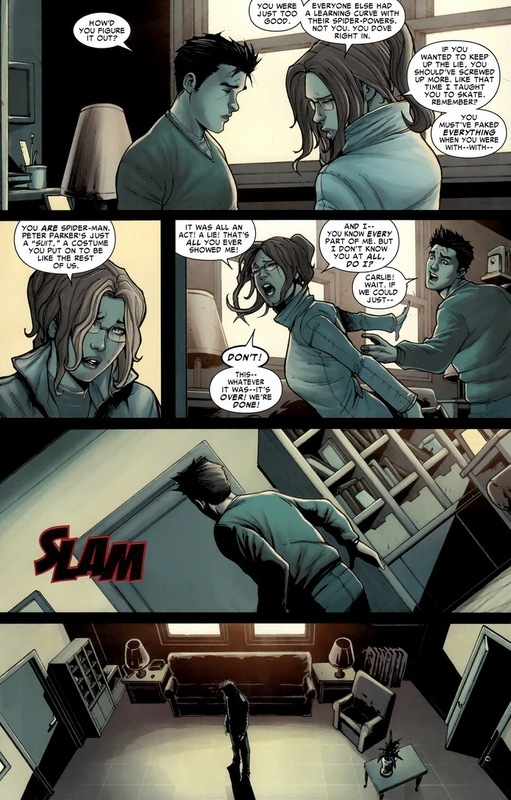 If you check out Alias #22-23, you can see their high school experience, but Jessica has a filthy mouth and I’d have to edit most of it out. Though Bendis wrote Alias beautifully. Now, I know what you’re waiting for. You want the gooey, emotional stuff. 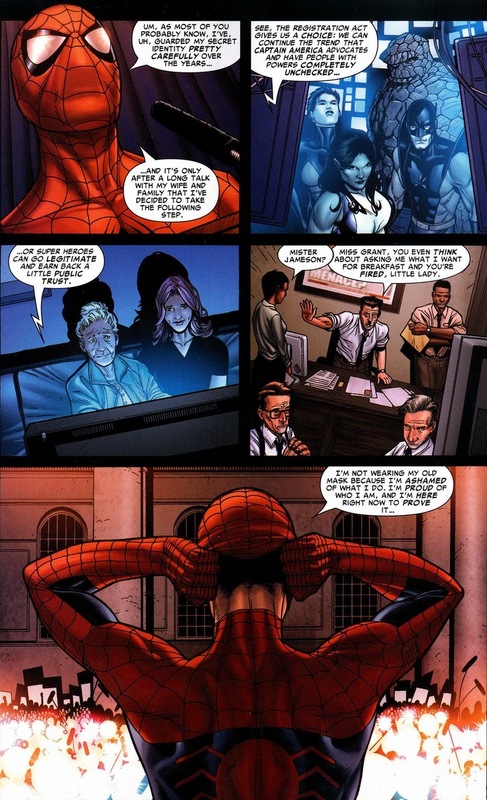 You want Peter pouring his heart out to Aunt May and Mary Jane, while they cry and cry and talk about their feelings towards Peter’s superhero career. I’ll get to that, but let’s jump to Carlie Cooper first. During the past few years, she turned into Peter’s first post-One More Day girlfriend. Forensic scientist by day, forensic scientist by night, and most importantly, she wanted Peter for more than his well-toned body, careful not to step on the remnants of his fragile and shattered heart — unlike some paramours (thatwitchblackcat). They were such in love all the up to Spider Island, the Marvel event where everyone in New York City developed Spider-Man’s powers. Yes, it’s as awesome as you think it is. 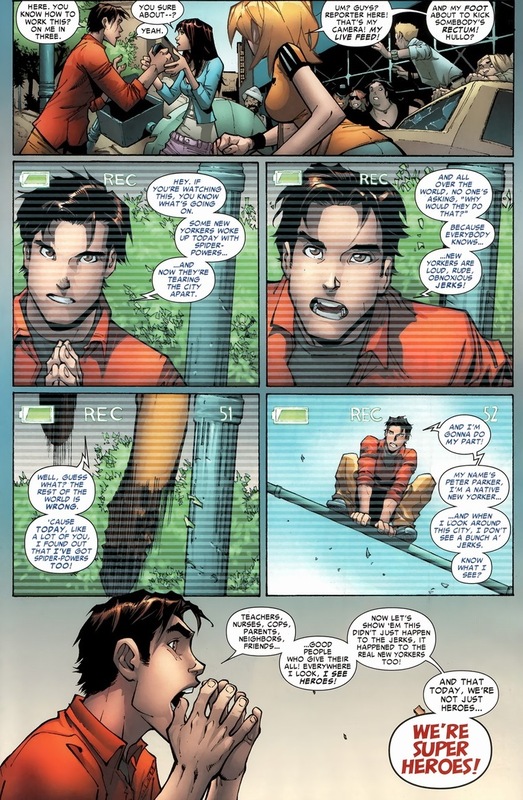 Y’see, in Amazing Spider-Man #668, written by Slott and drawn by Humberto Ramos, as the city suddenly broke from the weight of several million Spider-Men running around, Peter Parker rallies the troops as Peter Parker. Secret identity contained and whatnot. Unfortunately, that also sort of broke Doctor Strange’s magical/psychic mindwipe spell, allowing people to re-learn Spider-Man’s identity without a dramatic mask pull-off. 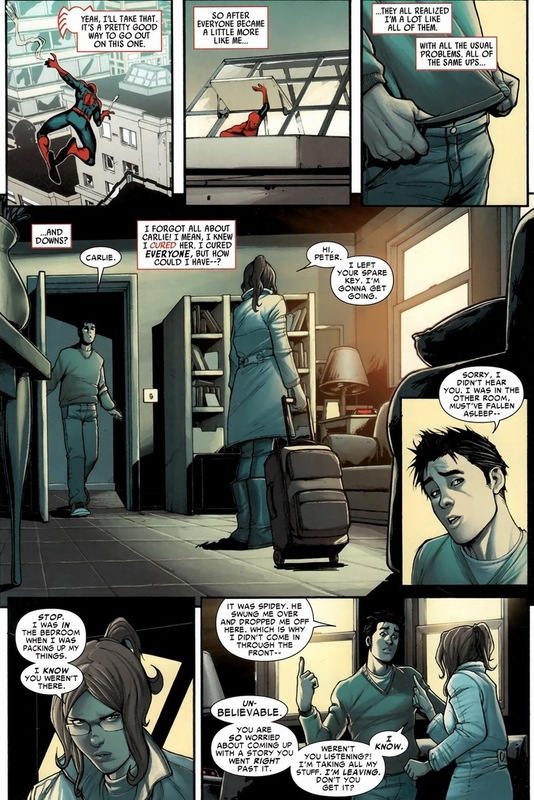 Like say, in Amazing Spider-Man #673, written by Slott and drawn by Stefano Caselli, when Peter’s girlfriend just realized their entire relationship was built on lies. 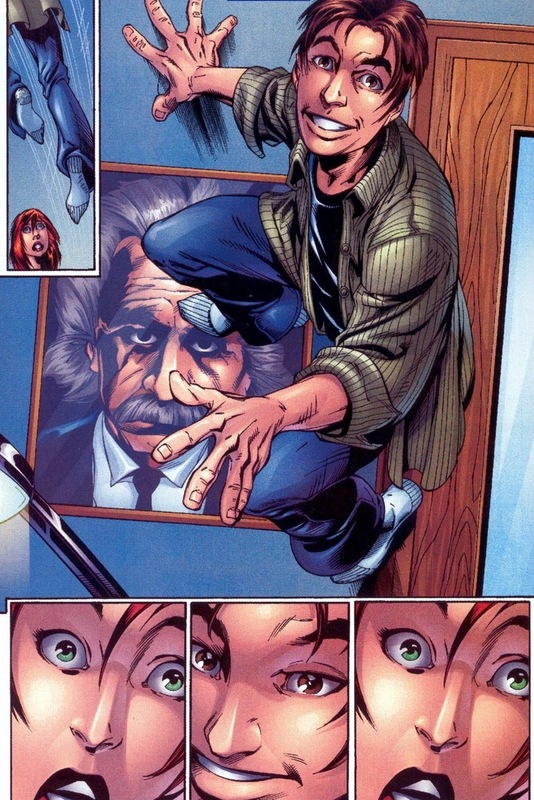 And then Peter Parker died. Twenty-seven issues later. 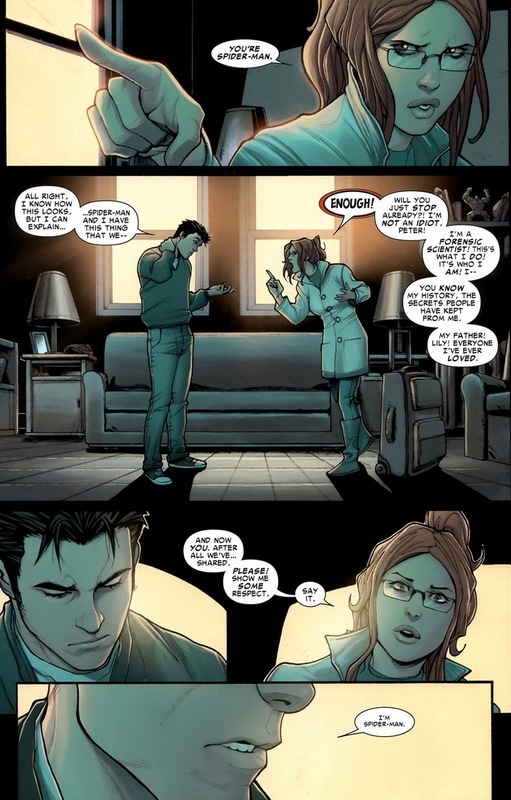 I’m not saying Carlie had anything to do with it by breaking up with him, but the world can sometimes be as cold as Doc Ock’s robotic, unfeeling tentacles. 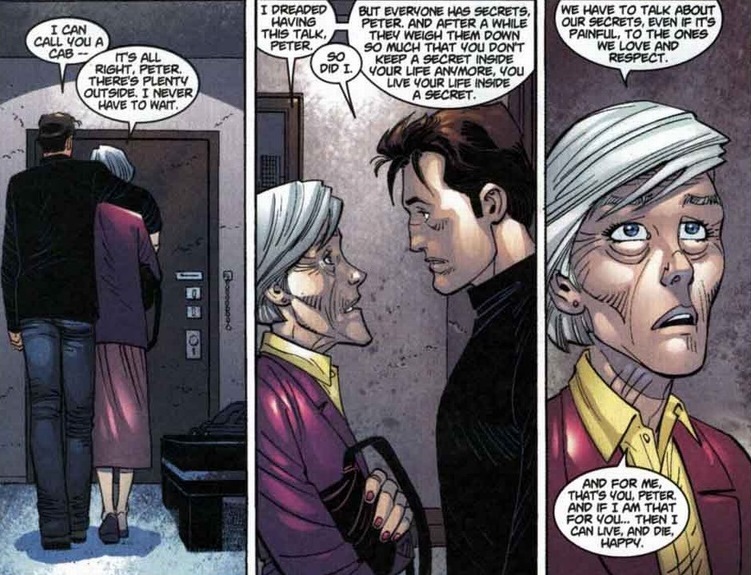 As we get into the most important of Peter’s dear supporting cast, Aunt May seems to be the most heartbreaking. Sure, she’ll understand, because she’s super awesome and understands the good Spider-Man does versus the constant fear of danger he gets put in dodging blasts of electricity. But the conversation always hits hard. 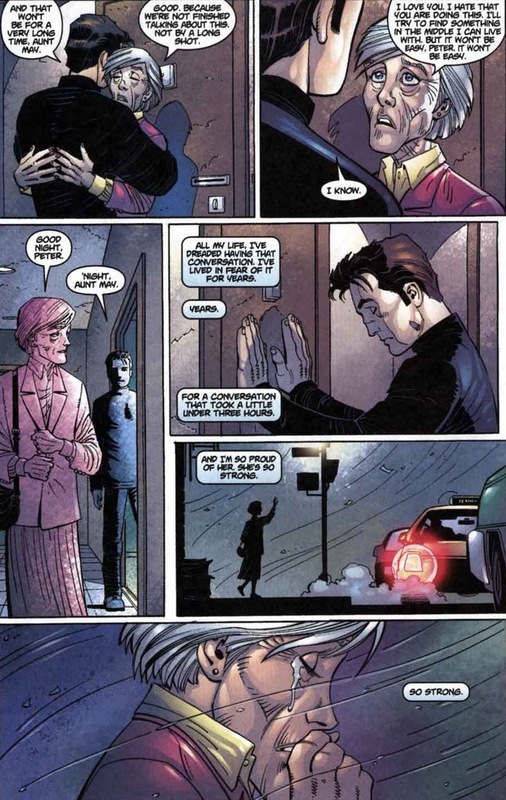 In Amazing Spider-Man #37-38, volume two, written by J. Michael Straczynski and drawn by John Romita Jr., Peter and Aunt May have the “talk” after Aunt May walks in on Spider-Man after that crazy brutal Morlun fight. I should admit that what you’re about to witness has been retconned. 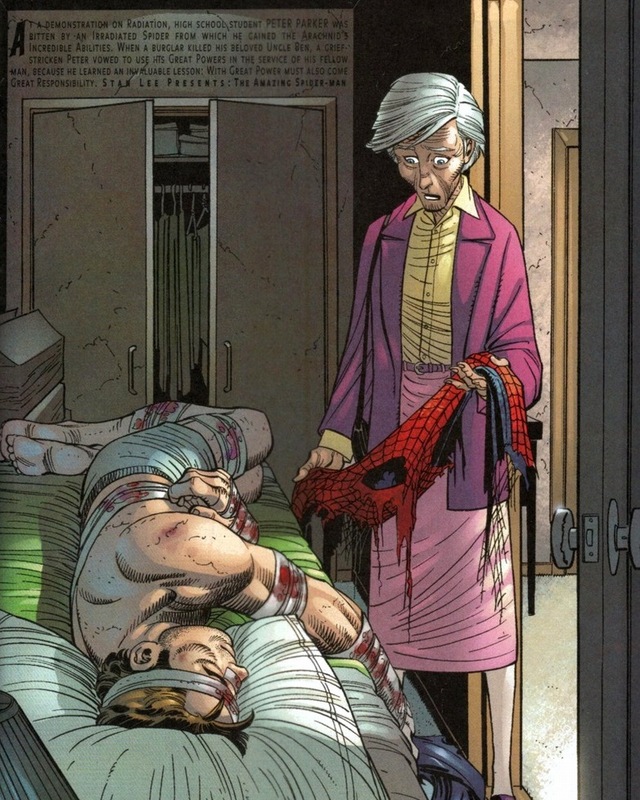 When Spider-Man’s secret identity went back in the bottle, Aunt May forgot as well. But regardless of the long-lasting impact, it doesn’t lessen the pain. This conversation takes up the entire issue. 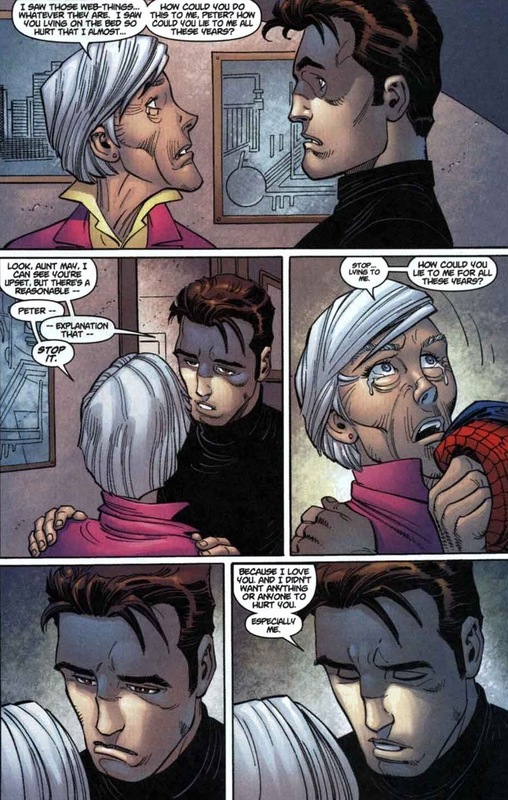 As Peter admits the truth behind him letting Uncle Ben’s eventual murderer go free after the wrestling match and Aunt May counters with a regret of her own, one may realize that life remains infinitely simpler when one doesn’t possess great power or great responsibility. Still, the issue wraps up and both characters improve because of it. Probably. Mary Jane has known Peter’s secret identity since Amazing Spider-Man #257-258 from 1984, where in a wildly dramatic speech reveals she’s known for years. You can read that yourself, because it’s 1980s soap opera at its finest. 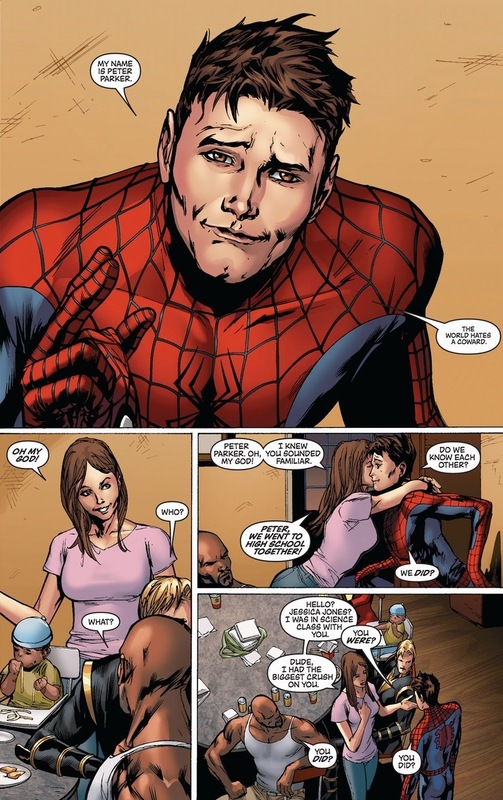 But speaking of fine soap opera, this’d be a terrible article if I didn’t bring up Ultimate Spider-Man, the alternative world fifteen year-old Spider-Man who starred in easily one of the top five best series of the 2000s. 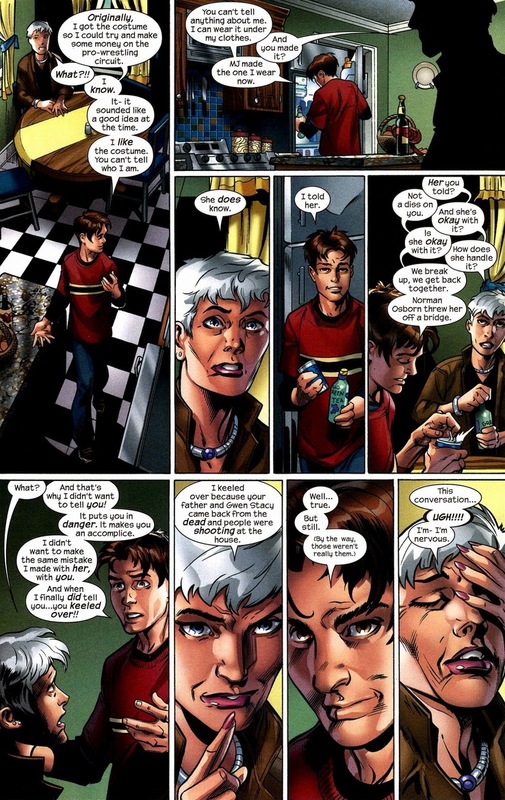 And to return to Aunt May, he has a similar issue-long conversation in Ultimate Spider-Man #111, written by Bendis and drawn by Mark Bagley & Stuart Immonen. 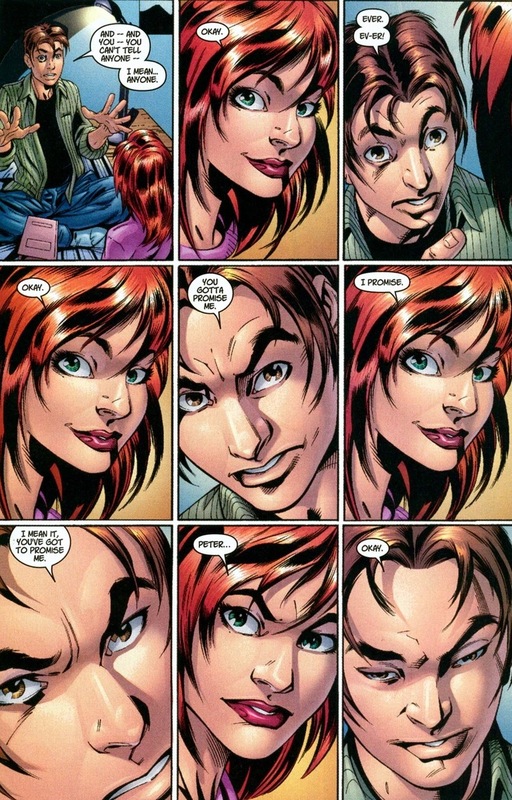 But I bring up the Ultimate universe for Ultimate Spider-Man #13, written by Bendis and drawn by Bagley, where Peter reveals his identity to also fifteen year-old Mary Jane in one of the best issues of the series. It’s delightful if you’re into teenage romance (I don’t judge), or if you know kids who want more from the superheroes than just punching (crazy kids, most likely). She doesn’t believe him. To be fair to Mary Jane, when I was a teenager, if I could get a girl to believe I was fighting crime as New York’s coolest superhero, I would also pour my lying heart out in a second. But y’know, proof is proof. 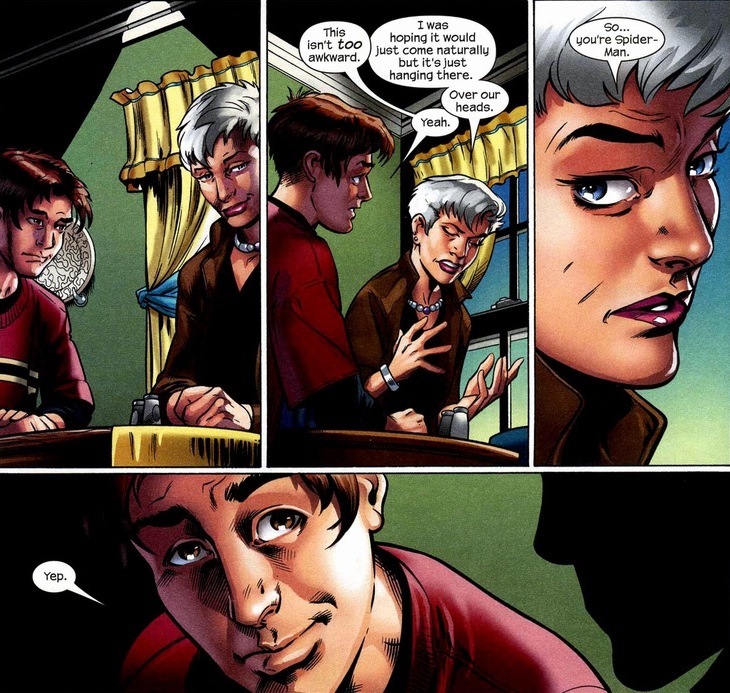 And thus, as Peter reveals his biggest intimate secret to his childhood best friend, so does Peter’s most meaningful relationship. 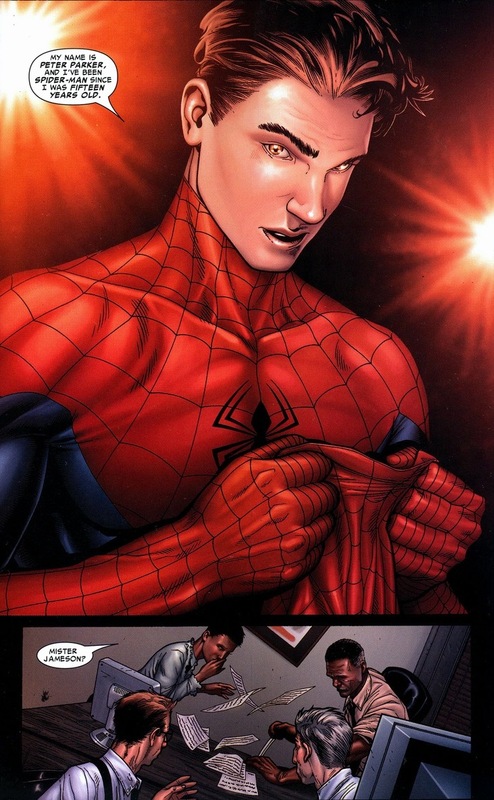 Teenage girls just can’t resist teenage Peter Parker. While they break up every twenty issues or so (constant danger, jealousy, or watching Spider-Man make out with Kitty Pryde on live TV), I still implore you to read the series if you haven’t. 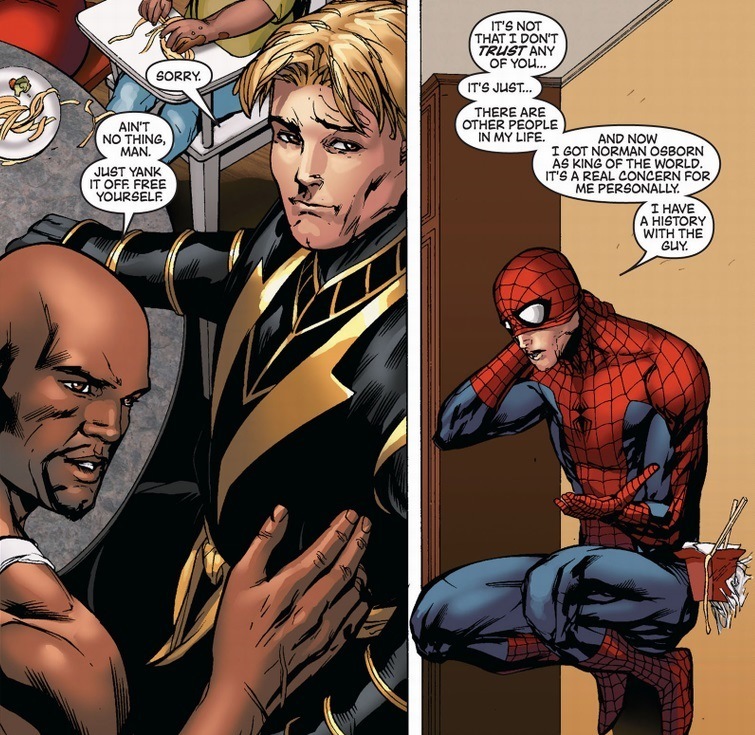 And read Miles Morales’ Spider-Man too. You deserve it. 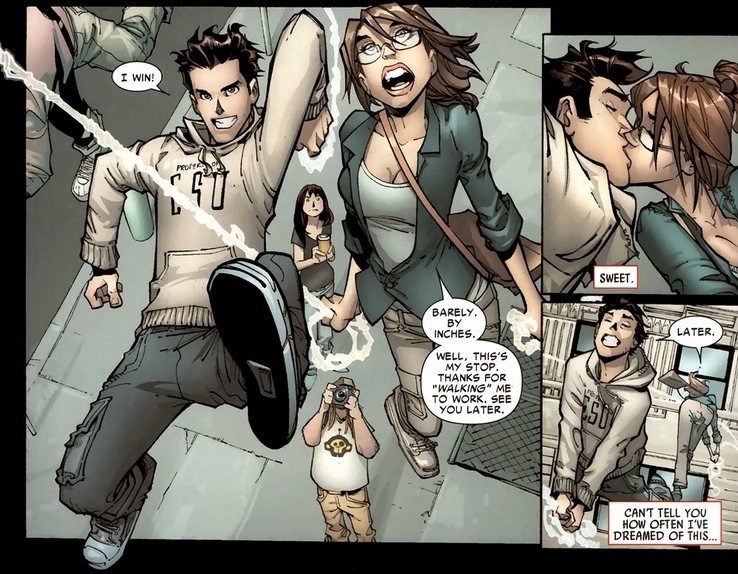 As I end today with a scene from Ultimate Spider-Man #10, written by Bendis and drawn by Bagley, remember the importance of secret identities — yes, sometimes it leads to make out sessions with your high school crush, but sometimes not just people superheroes love and care about get hurt. Most importantly, my goodness do I love Spider-Man. Haha, you know the readers so well. I don’t come here for fight scenes. I come here for character drama.